The salary offered by employers in Phnom Penh ranges from one extreme end to another: it can be a generous expat package for Western executives or just a sum that is enough to pay for your basic needs. It all depends on the company you’re joining. You may also explore freelance work such as writing and tutorial jobs online. This will give you the flexibility of working at home and at your own terms. 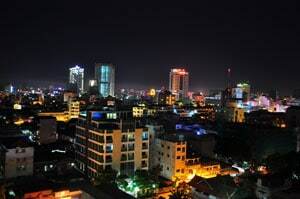 You’ll find nearly all types of companies in Cambodia’s capital city. There are global banks, insurance companies, publishing houses, engineering and construction firms, travel agencies, language schools and more. The capital is also home to numerous non-profit organisations (NGOs) that employ well-compensated country managers and volunteers who are barely receiving anything. It’s imperative to have basic knowledge on Cambodian labour laws to protect yourself either as an employee or employer. A full-time employee renders eight hours of work a day and 48 hours a week. Overtime work can only be rendered for exceptional and urgent work provided that the total working hours, inclusive of overtime, doesn’t exceed 10 hours per day. An exemption is when a worker is required to render longer hours to prevent a disaster or repair disaster-related damage. Sunday is a typical day-off for workers in Phnom Penh and the rest of Cambodia except for those in the hospitality and healthcare sectors implementing rotating schedules. The rule is that all workers are entitled to at least one full day-off per week. Under the labour law, every worker who has completed one year of service is entitled to an annual leave. Those working for 48 hours per week are entitled to 1.5 days of annual leave for one month of service or 18 working days every 12 months. The annual leave of workers rendering service for less than 48 hours per week is computed on a pro-rata basis (if you’re working for 40 hours per week, you’re entitled to 1.25 days of leave per month or 15 days per year). Your income tax rate depends whether you are a resident or a non-resident. A resident, for taxation purposes, is one who (1) is domiciled in Cambodia, (2) has a principal place of abode in Cambodia, or (3) is present in Cambodia for more than 182 days during the 12-month period ending in the current tax year. A non-resident is one who doesn’t fall under these categories. Non-residents are taxed a flat rate of 20 per cent on salary from Cambodian sources only. There’s a wealth of information on job openings in Phnom Penh freely available online. Some of these include topjobcambodia.com, phnompenhpost.com, cra.com.kh and monster.com. You may also seek the professional assistance of head-hunters who will do the job hunting for you. Phnom Penh is the address of many NGOs, you may ask your embassy or consulate for vacancies in these organisations. Many expats in Phnom Penh, mostly volunteers in NGOs, teach English. There’s no standard qualification and the barriers to entry is pretty low. An English teacher holding college degree usually earns about US$10 to US$15 per hour. If you want to make a career out of it, it’s advisable that you get certifications such as the Teaching English as A Foreign Language (TEFL) or the Certificate in English Language Teaching to Adults (CELTA). These can help get into good schools and command a higher salary. Living and working in a foreign country is truly a rewarding experience. You get to immerse in different cultures and meet people of various faiths and ethnicities. If you decide to work in a Cambodian company Phnom Penh, you may be surprised by the business culture. Cambodians tend to bow down to people in occupying higher posts in a company, such as a manager. Employees are likely to agree on whatever the bosses say without any objection. Cambodians are not confrontational people as they view “saving face” as protecting one’s honour and reputation. If you need to clarify things with a colleague, do so privately and in a calm tone. Displaying strong emotions in public is also frowned upon. If things get tough, close your eyes and breathe.